Darvill Nursery specialises in supplying Quality Australian Plants and Tube Stock for the retail, wholesale and landscaping industries. We are a n innovative and expanding New South Wales owned business based near Sydney. Climate controlled facilities enable propagation of a wide variety of stock from cold, temperate through to tropical climates. We can supply plants to all Australian states except W.A., Tasmania and South Australia. We operate under the direction of accredited horticulturalists who are active in the industry. Cut-leaf Wattle - shrub to 3 m - stiff triangular grey phyllodes - golden flrs in Sp - drought and frost resistant. Fringed Wattle - spreading shrub to 6 m & fast growing - dense narrow foliage - yellow flrs in Sp - frost hardy. Flinders Range Wattle - ornamental shrub reaching 5m - pendulous branches of blue green foliage - pale yellow flrs in Wi and Sp - frost resistant. Shrub to 2 m tall, good for hedges - green foliage with bronze new growth - fluffy cream blossom during Sp followed by edible pink & purple berries - enjoys fertile moist soils - light frost only. AFRICAN VIOLETS��� Saintpaulia African Violets were found growing in the leaf mulch of rocky crevices and the forest floor in a small area of East Africa. Hence the importance of a light and porous SOIL FREE Potting Mix. After extensive research we have developed a system that allows these plants to grow without continual feeding and fungal rooot rot that often occurs some months after purchase. African Violets should flower throughout the year given the correct growing conditions. To encourage flowering just remove a few of the newer leaves. 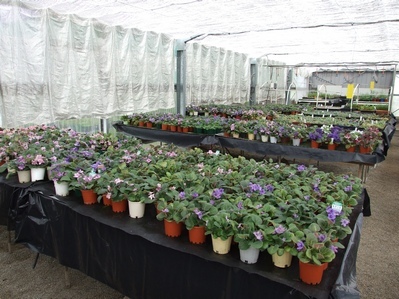 Lighting: The light source is one of the most essential elements of African Violet Culture. African violets thrive in plentiful filtered light (about 50% shade plus or minus a bit). Early morning or late afternoon sunlight is fine near a window. Temperature: African violets prefer a humid environment with an even temperature and grow best between 18C and 27C, with night temperatures not below 15C .� Fortunately this is what we find inside most homes but not on an outside verandah. African violets enjoy humidity and fresh air, but are adversely affected by drafts. Watering: Place your violet in a tray or container and only water from the base sufficiently so that the water comes up to a maximum of 10 mm from the base of the pot.� Leaves can be damaged if they get wet. If the potting mixture becomes dry; just place water in your container so that the pot can take it up by capillary action. For very dry pots it may be necessary to place the pot in a container with� sufficient tepid water so that water gradually rises through the soil to the top. Avoid getting leaves or flowers wet, as this can damage them. Feeding: After about three months the plant can be fed with � teaspoon of a slow release fertiliser such as Osmocote Native which should last nearly a year without further feeding. Cast Iron Plant - upright dark green leaved clump forming plant to0.5m. Indoor foliage plant or for shady verandah area. Well drained soil, shady location. Midyim - Low spreading shrub 50 cm high x 1m wide - foliage develops reddish shade in colder climates - wh. flrs followed by sweet edible wh. speckled berries - water essential - moderately frost resistant. Hardy spreading shrub to 1.5 m high & 1 m wide- trim to hedge - thick green foliage & coppery new growth - white flrs in Sp & Su - tolerates light frosts. Suitable for free draining soils. A dense sprawling shrub to 1 m high by 2 m wide, trim to hedge - small dark green round leaves - white flrs along stem in Su - tolerate moderate frost. Dense round cushion shrub to 0.3 m high x 0.5 m wide - fine light green foliage - masses tiny white flrs in Sp - medium frost only. Heath Banksia - shrub to 4m - narrow dark green leaves - long bronze flr spikes in Wi - frost resistant. Heath Banksia - shrub to 4m - narrow dark green leaves - long red & yellow flr spikes in Wi - frost resistant.